Edward Goodrich Acheson was trying to make an artificial diamond when he heated a mixture of clay and coke in 1890 – and ended up with silicon carbide instead. The compound has since been used for sandpaper, bulletproof vests and gemstones, among other products. 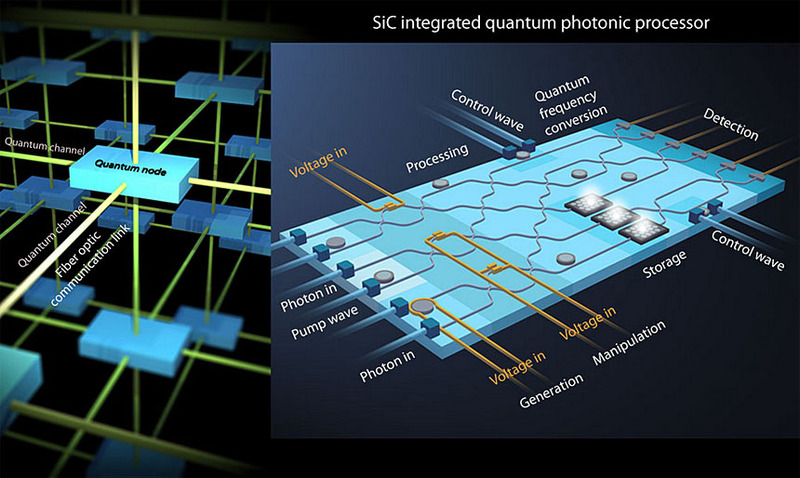 Now a “dream team” of experts from the University of Rochester, Chicago, MIT, and Case Western hope to demonstrate it can also be used to build chip-scale quantum photonics processors that could revolutionize secure communications and advanced computing. Principal investigator Qiang Lin at Rochester, and his co-principal investigators, David Awschalom of the University of Chicago, Jurgen Michel of MIT, Philip Feng of Case Western and John Howell of Rochester, have secured a $2 million grant from Emerging Frontiers in Research and Innovation (EFRI), a National Science Foundation program for transformative ideas that have a strong potential for long term impact on national needs or a grand challenge. The grand challenge for Lin and his colleagues involves using silicon carbide to harness the quantum mechanical properties of photons – the elementary particles of light – to transmit information via fiber optics from one “node” to another. This would enable long distance networks to carry out complicated functions more quickly, efficiently and securely than current technologies. For example, through a phenomenon known as quantum entanglement, photons encoded with information could be routed over vast distances through fiber optic cables to link with a photon counterpart on the other end. Any attempt to tamper with the data would alter the entangled photon's quantum state so that the quantum key needed to unlock the encryption would no longer work, and the communication would remain secure. The key is developing “nodes” – or processors – that can function at or near room temperature to create, process, store and then route information. Most quantum communications approaches to date, demonstrated in laboratories, work only at very low temperatures or require bulky, energy-intensive equipment. Even a promising platform that does work at room temperature, using diamonds, has been hindered by serious technical challenges, including the difficulty of fabricating diamond wafers. 1. Specific “defects” that emit photons that can be controlled and manipulated to code information at room temperature. 2. Nonlinear properties that make it easier to convey information from one wavelength to another. Their project is primarily fundamental research, but could eventually provide a pathway to applications relevant to the AIM Photonics initiative. The consortium of university and industry partners, headquartered in Rochester, seeks to advance U.S. manufacturing capabilities in integrated photonics. Three of the team members, for example, are experts in various quantum aspects of silicon carbide: Awschalom (spintronics), Lin (nanophotonics) and Feng (material processing and nanoelectromechanics). Michel brings expertise in on-chip optical detection and modulation. And Howell’s expertise in quantum measurement, quantum imaging and communication will be valuable in validating how well the nodes function as part of an overall network. Lin’s team will be supported by three experts in single photon detection at the National Institute of Standards and Technology: Thomas Gerrits, Richard Mirin, and Sae Woo Nam.